By now, many folks across the U.S. have heard about the Starbucks manager who called the police on two Black men in a Philadelphia store. The Black men were waiting for a friend to arrive when one of them asked to use the bathroom. The manager told them that they were trespassing because they had yet to purchase anything. Four uniformed officers arrived and arrested them. Their friend arrived during the arrest. I witnessed a similar encounter. At Newark Penn Station, I watched a cop ask everyone in the seated Amtrak area if they had a ticket. If they didn’t, she told them to leave. One woman started crying. She’d been up all night, had just collected enough money for Dunkin Donuts hash browns, and didn’t want to sit on the floor to eat. The police officer made the woman stand and eat outside of the seating area. Why does a cop have the power to manage Amtrak’s seating area? Who or what are they protecting? Additionally, there was ample seating and it was inside a public building. This police officers did not solve any problem. She used her authority and ability to use violence to make a woman stand up to eat hash browns. This act does not stop the problem: homelessness. It shifts the problem to another area. A social worker or community organizer could have been paid to connect that woman to the services and just outcomes she needs. Not an officer. After Starbucks incident, calls to “Boycott Starbucks” soon hit radio, social media, and television waves. The idea that a manger called the police on these two men is clearly racist and problematic. Many of us have gone to a coffee shop, used their bathrooms, Wi-fi, cold water on hot days, and heat on cold days with little to no fuss. Minorities and poor people feel additional anxiety because, even when we do pay for our goods first, we are still bothered by employees, patrons, or police. I support the idea that people should not spend their dollars at places that perpetuate racism and classism. But I have two questions. First, have we long ignored the classist practices that cities help businesses like Starbucks perpetuate? Second, do we want to spend our dollars supporting the police? The first answer is yes. Organizations like Arch City Defenders in St. Louis regularly represent homeless people who police arrest for trespass because they are sitting inside coffee shops. Their clients are arrested for using private bathrooms, sitting inside establishments for heat, and for public urination. In a city that lack public restrooms, and where police officers spray water on sidewalks during the winter to prevent people from sleeping on the ground, it is a crime to be inside and outside. To curb this behavior, businesses print bathroom codes on receipts, large objects on keys, or just flatly tell perceived non-patrons “no” when trying to use the bathroom. This is a problem. The answer to the second question is no, hopefully. We should not continue to fund the police. 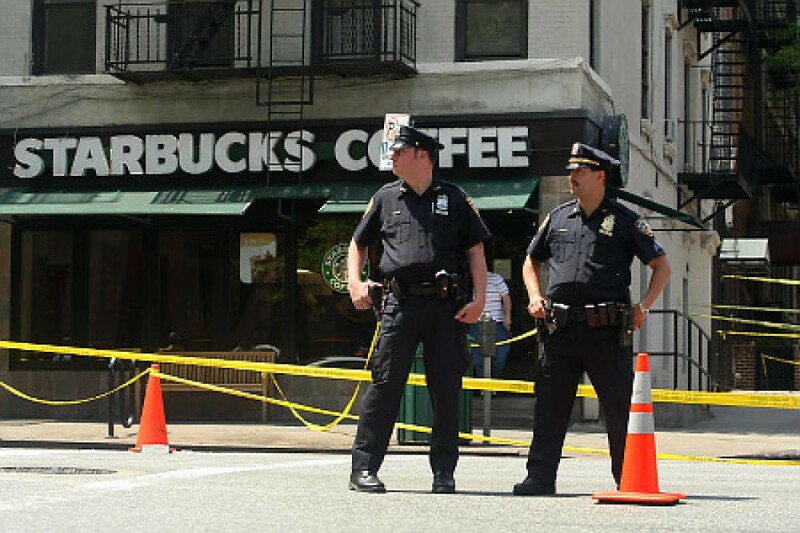 The police officers who arrested the Black men at Starbucks were just doing their job. That’s the problem. It’s the police’s job to make sure that people don’t take from the rich. The Starbucks CEO is the 232nd richest person in the United States, with a net worth of $2.9 billion as of 2016 (The starting pay for a Starbucks barista is $7.63). And the police department receive major budgets to accomplish this task. Philadelphia Police Department is requesting $652,106,097 from the City this year. This is not including additional $20,583,079 that the Department will receive in federal and state grants. That’s more than half of a billion dollars to mostly address “crimes” that people face due to being poor, lack of substance and mental health resources, homelessness, trespass, the consequences of school closures, and much more. Imagine if Philadelphia invested all of that money into combatting reasons why people commit crime, like systemic inequality, poverty, education, and health? We would not need police or prisons. Activists voice a legitimate fear: calling the police could have put those Black men in danger of their lives. This is right. But that just isn’t a Starbucks problem. That is a police problem. We must continue to reduce or eliminate contact between people of color, poor people, and the police. If we want to keep Black people, poor people, homeless people safe, we should listen to movements that call for us to invest in them, not police.